Dust bunnies sometimes have a life of their own. Not only are they unsightly when they’re hopping all over your home, but they can really cause misery if you or other family members are allergic to them, especially on cleaning days. For those with allergies, here are some tips to make cleaning a little more bearable. 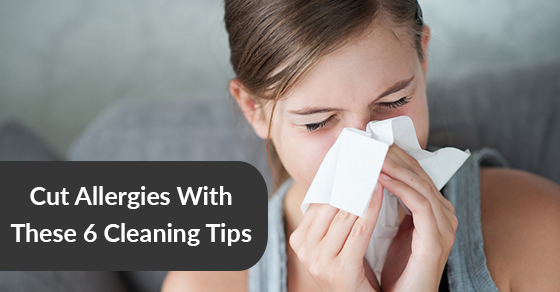 Allergies are nasty any time, but if you spread out your cleaning time so you only have to do a few things every day, it might make symptoms less problematic. Keeping your home clean is essential to keeping allergies at bay. Vacuuming regularly (at least a couple times each week) will keep dust to a minimum. Make sure your vacuum has a HEPA filter, which will trap particles you can’t even see. Vacuuming is better than sweeping, which just tends to move dust around. Remember to vacuum curtains. They’re great hangouts for allergens. Just like expert cleaners who offer home cleaning packages, make sure to use a duster or lint-free cloth (microfiber is a good choice) to dust furniture and other items where dust can collect. This should be done at least once a week to keep allergens at bay. Your bed sheets aren’t safe from things that can make you feel nasty if you have allergies. They’re havens for pet dander (if you have pets), pollen, dried skin, etc. Washing them every week will cut down on possible allergens that will stuff you up or make you sneeze. Vacuuming your duvet and mattress will also be a big help. Dampness and allergies love each other, so having a wet bathroom is not conducive to keeping allergy symptoms to a minimum. Those businesses which offer home cleaning packages know that a damp bathroom can lead to mold, and mold is unhealthy for everyone. The shower stall, walls and floors should be wiped down after each shower. Leave the bathroom door open so the space can air out. Leaving the shower curtain to one side will also help the shower area air out and dry. The more things you have in your home that you don’t use, the more dust you’ll have. Remove items that are just sitting around. Sell them, donate them, or give them to friends. Shelves full of knick knacks covered in dust won’t do your allergies any good.